In the most recent Chuck Chats! 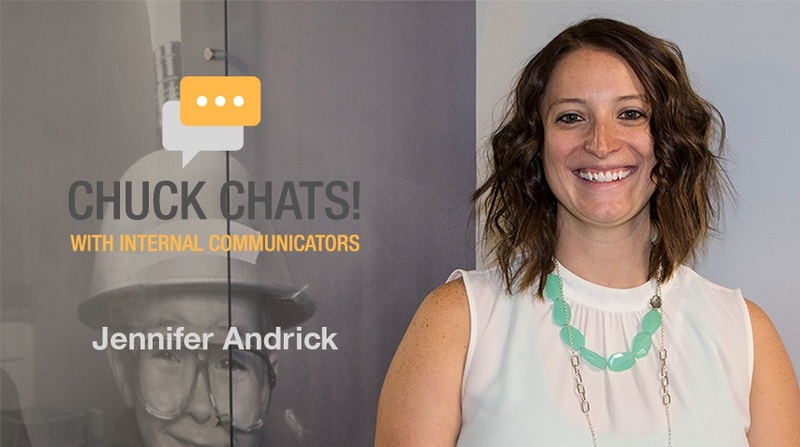 interview, I talked with Jennifer Andrick. She is a public relations professional specializing in corporate communications. She is currently the Internal Communications Consultant at Medxcel Facilities Management, the largest provider of healthcare facilities management services in the United States. It’s the foundational element of taking something complicated (like a new product launch or a change in the organization) and being able to tell it in a way that everyone across the company can understand. That’s the journalist in me coming through. Regardless of the channel or piece that you are working on, I always think with my reporter hat on, of the “who, what, where, when, how and why." If I can get my internal customers (the ones who are leading the product launches or campaigns) to answer those questions, they can help simplify what they are doing, stripping it down to the important information that I need. It sort of gets them out of their box too because they get so wrapped up in the jargon and details of their project it forces them to zoom out. When employees understand the WHY behind a change they are more likely to get on board and you don’t have to put as much effort into forcing them to do something. It also helps them understand what’s in it for them. As communicators, we’re still customer service reps. It’s definitely more evident in employee communications, but our first priority are those groups we are communicating with.